Advance CTE will be writing a series of blog posts profiling the policies and practices of free college in the United States. This post will explore the history of the movement toward free college. Check back for blogs on the challenges, successful practices and future of free college. College affordability, or lack of affordability, is one of the most pressing problem in the world of higher education. Free postsecondary education has long been a topic of conversation, and various models have been piloted at the state and local levels. The Atlantic’s “Debt Free” article explains that this idea was given renewed national attention when former President Barack Obama addressed the topic in his 2015 State of the Union speech. In particular, President Obama advocated that the place to start implementing such policies was in community colleges. 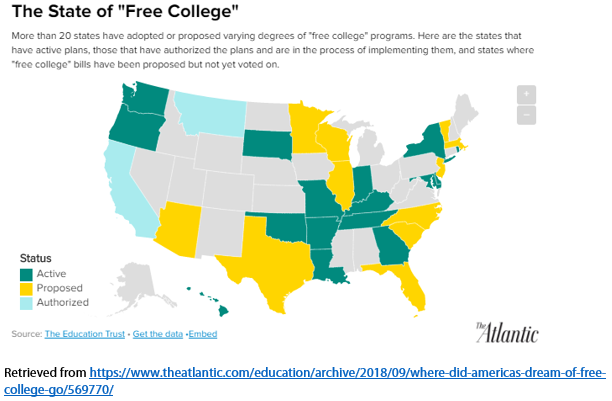 Afterward, with the upcoming presidential election campaigns underway, the conversation of free college remained part of many candidates dialogue. Senator Bernie Sanders (I-VT), for example, was a vocal advocate. When the University of California (UC) system was started in 1868, free admission and tuition for in-state students was ensured. The California State and community-college systems decided the same. However, in 1960, California’s Master Plan for Higher Education allowed for students to be charged certain fees. In 1970, students were charged an “educational fee,” which has increased over time.. From that point on, California continuously decreased the amount of funding towards high education. In 2004-2005, UC allocated only 16 percent of funding to higher education compared to 32 percent in 1974. A main driver behind institutions pulling back on free college practices has to do with the significant increase in enrollment, as reported by the National Bureau of Economic Research. Whereas in the 1909-1910 school year only 355,000 of Americans 19-24 years old (2.9 percent of those in that age bracket) enrolled in higher education, by 2012 that number increased to 31.4 million (41 percent). At the same time, state and local funding for public colleges and universities decreased. Just from 2008-2016, overall state dollar allocation across the country to institutions of higher education has declined by 16 percent. If free college policies were put in place at the founding of an institution, the combination of increased enrollment and decreased state and local funding made the model unsustainable. This week, our partners at Young Invincibles launched an 18-state National Youth Bus Tour that will take them to every corner of the country listening to the stories, issues, and solutions of young Americans. Â They’ll be co-hosting roundtables with young adults (18-34), both in school and out, to talk about critical issues like jobs, higher education and health care, and then bringing those voices directly to our political leaders and the media. You can sign up to do your own youth roundtable by emailingÂ Members@YoungInvincibles.org, or join an existing event. Â Check out the tour schedule atwww.YoungAmerica.is. Â You can also help by tweeting or posting on Facebook whatÂ #YoungAmericaIs to you (ex. entrepreneurial, uninsured, trying to graduate, etc.). Â Follow the bus tourÂ onÂ Twitter,Â Facebook,Â Tumblr, and at www.YoungAmerica.Is. Curriculum and classroom level: Provides common starting ground and expectations regarding the development of programs, courses, assignments and assessments. While President Obamaâ€™s call to increase the number of college graduates in America has been widely publicized, greater attention must be paid to the quality and the meaning of degrees to be conferred upon a record number of students. To increase the quality of degrees at all levels, the Degree Profile helps colleges and universities to make changes in five basic areas: Broad, Integrative Knowledge; Intellectual skills; Applied Learning; Civic Learning; and Specialized Knowledge. Under each area, Lumina identifies specific learning outcomes for each degree (associate, bachelorâ€™s and masterâ€™s degrees). 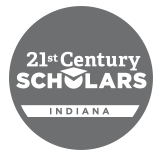 With the input of two accrediting agencies (Western Association of Schools and Colleges and The Higher Learning Commission of the North Central Association of Colleges and Schools) and the Council of Independent Colleges, the organization plans to test and make adjustments to the degree profile. For more detailed information, please see the Lumina Foundation website.